Has minimum activity and/or participation requirements. These are the guilds that are about camaraderie and fun but also about teaching new players and helping them progress further. Part of having fun means completing as much guild-related content as possible with varying degrees of importance on the level of that content. As such, members are expected to contribute their fair share to guild activities. 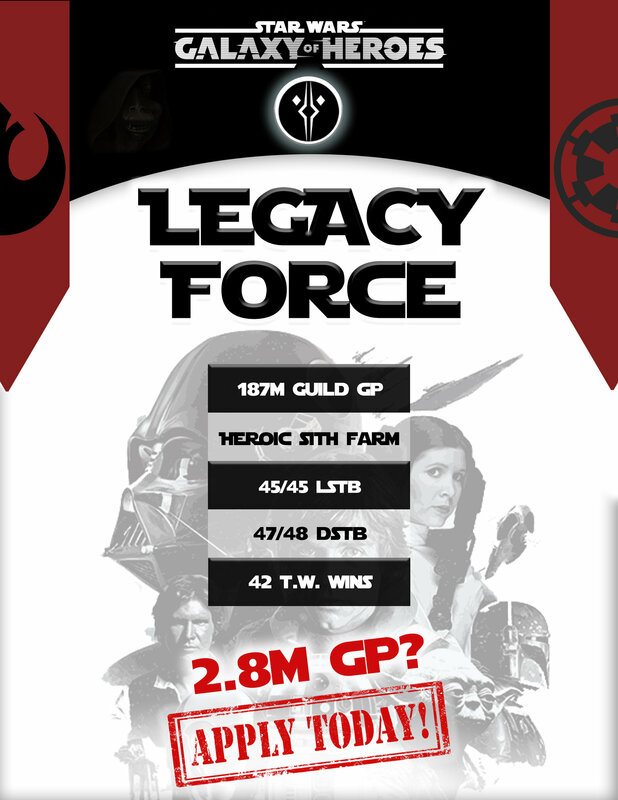 Legacy Force is still recruiting! DM me on Discord induztre#4505 or send me a message on here. 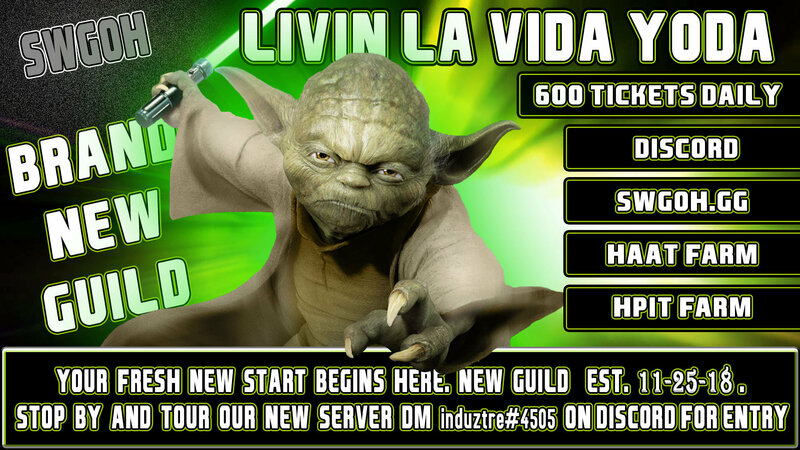 -Contact me here or just join the guild! -No Discord or Line required, the in-game chat is enough for us. Talk English, Spanish or Galactic Basic. -Guild reset time is at 0030 UTC. -We alternate between Rancor VI and Heroic until everyone can handle Heroic. 24h join period AND 15% damage cap in 1 phase for the first 12h of play. Everyone gets a piece. -Playing AAT easily and working towards HAAT. Players who invest in specific HAAT teams are always welcome. -STR tier V until we've raised our member count. -We play as often as we can! -We booted 20-25 members for not joining the TB/TW a few days ago. -TW: about 50/50% win/loss. Joining and setting defense is expected of you. -TB: 16*, if you don't play, at least Deploy your units. -No specific toons required though CLS, JTR etc are always welcome. -We're pretty motivated and set the bar higher whenever the majority of us can handle it. Weaker players won't be booted but are expected to invest in getting stronger. -Disregarding Raid rules or missing TB / TW: 1 warning, 2nd warning is kick. -Inactive for 10 days and you're out. RedEyedRebels is recruiting new members! We’re a group of daily players who like to get high and play/talk Star Wars. Join up today if you’re a daily player and want to join a fun but competitive guild! We have a group chat on LINE that you are welcome to join but it's not required. Guild is open to join and we can invite you to the LINE chat when you join. Calamitous Intent is seeking active members. Guild activities on US Eastern time zone. Heroic HAAT & Rancor raids, 24 hr. Join period for both. We recently completed a guild merge to create a HSTR guild. So we offer mobility up to the ally guild when you get squads ready. The plan is for our original members to come back as they complete the farm (or if they tire of the grind) & wind up with 2 HSTR guilds. Looking for active players to earn tickets & participate in Territory Wars and Battles. Traveling through hyperspace ain't like dusting crops. We are an active guild that's recently graduated from being casual and we're looking to grow and advance without losing our fun loving nature. Our guild name is Latin for "Play the game"! Fun is the top priority and we do our best to make all guild activities fair and rewarding to all members. Our Timezone is GMT+2 (South Africa) with a ZERO damage rule (No damage until a ZERG command has been given). Currently we can complete Heroic Pit, Heroic AAT and T5/T6 Sith Raids. Heroic Pit Raid starts at 19:00 GMT+2. Open to attack at 19:10 GMT+2 (Wait for ZERG command). 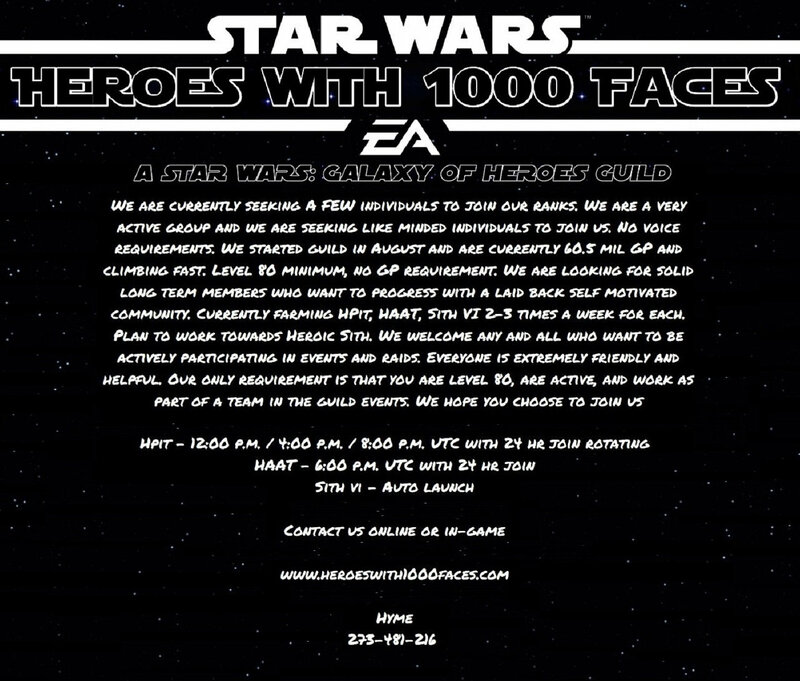 Heroic AAT Raid starts at 19:30 GMT+2. Open to attack immediately (Once we are stronger we will implement ZERO damage rule). T5/T6 Sith Raid starts at 20:00 GMT+2. Open to attack immediately. We are struggling with Territory Wars as we sometimes can't start them. You can help us change this. We have about 70% winrate when we do manage to open a TW. With Territory Battles we average 18-20 stars in Dark Side TB and 18-20 stars in Light Side TB, we need your to help these numbers grow! 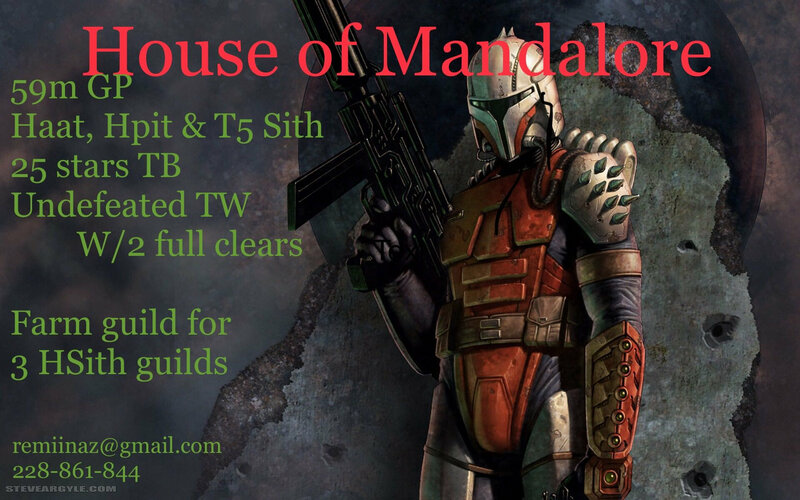 We are looking for a few players with advanced rosters to help us take down the Heroic Sith raid. We are currently doing T6 at a good rate, and we are reasonably close to HSTR, but we need to replace a few inactive players to progress further. (Jedi, JTR, Nightsisters, you know the drill). Our time zone is CET, many of our players are from Belgium but we speak English in chat. Obviously we also do heroic AAT and Pit, and get a somewhat appropriate amount of stars in TB for our GP. 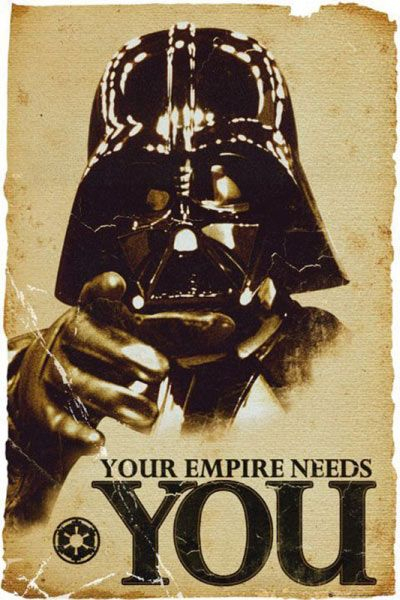 Inglorious Blasters is looking for up to 10 active people to fill up our ranks. 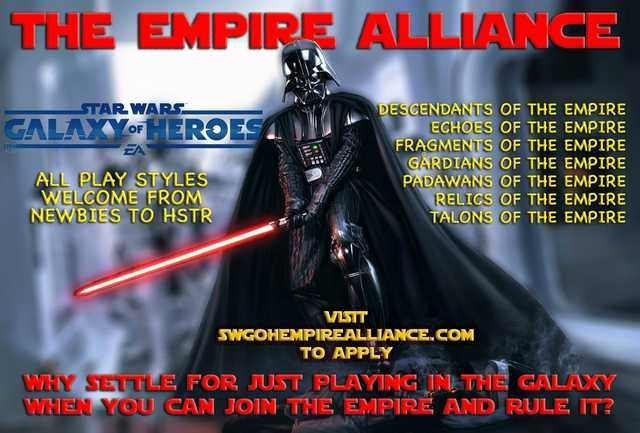 Must be looking to do Sith Raid on heroic and active a majority of the time. We are laid back but request that you communicate any absence greater than two days. Current raid schedule is 6pm EST with 24 hour join period. We do tier 6 of the Sith Raid in about 2 days and are ready to start the heroic tier once we fill up. TW success rate at 85%. Please private message if interested. Join a group of people who have fun while helping each other out! ZNT is an independent guild run by veteran players. We do not force people to farm characters or spend money. While we maintain a relaxed approach to this game, we are highly organized where it counts: Territory Wars and Battles. Slack Information provided on admittance. Chairborne Rangers (currently 57m GP with 37 people) want you to join us. I am the leader of this guild and I am in EST but we have people from East to West Coast and we rotate the raids' times between EST and PST (we're flexible). We are doing HPIT & HAAT 2 or 3 times a week (24 hours join in period). We're a casual new-player-friendly guild, the only real rules we have are to be nice and to sign up for the Territory War! Rancor 7 and try and let people who don't have Han Solo at 7* rank highest. Sith 4 or 5 depending on how many tickets we have to burn! And as for the Tank ... we can kill Tier 1 in less than 12 hours and are working as a Guild to put teams together for Tank 2 and we're getting close to being ready to destroy it! Join us for the kill! Sign up and say hi in chat and you'll get a friendly welcome! I look forward to meeting you in game! Tosche Station Cantina is an independent guild that is recruiting players with a minimum of 1.5M GP and at least one HSTR team JTR/NS/Chex. All we ask in return is that you be active too! We're a fully Heroic guild with HSTR on farm and we're hungry for more! We have a 24/0 rule and rotating launches on raids so all may benefit. We're focused on getting better results every Territory Battle and War and would love some strong, daily players to come and help put us over the top. Guild reset is 6:30pm Eastern (22:30 UTC). Our current GP is 130M. We're hitting around 33/35 in TB and win almost all of our TW by a shutout in the 120M tier. We are a community of 42 with a GP of 93 million. Looking for people who are or are close to HSTR ready. We are USA CST based with Guild reset at 6:30 pm CST (11:30pm UTC) but also have multiple international players in our Guild. 3. Active daily to help generate raid tickets. 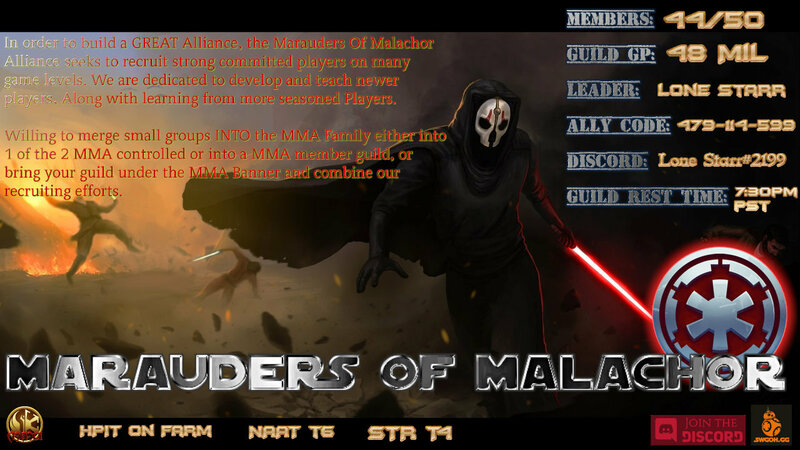 New Rebel Order is looking for members who love to play and possess a desire to become stronger gamers through teamwork and camaraderie. We are a small, single guild of up to 50 members to promote interpersonal growth. We are not part of a multi-guild community so once you join, you remain. We have specialists in every aspect of the game who are just waiting to help. We are content being a small yet solid group of gamers and are not interested in joining an alliance. Only mergers we will consider are those willing to merge into us. Guild reset is 7:30p EST. 1. Discord is mandatory. If you are not on Discord upon joining you have up to 2 days to comply or you will be removed. As a bonus, we are offering Raid Han, General Kenobi and Rebel Commander Leia Organa shards to every incoming member. All you need is a 7* character to participate in the heroic raid! Don’t have one yet? Not to worry, we’re happy to help you get one and more! So stop on by our Discord server below and let us show you a wickedly awesome Rebel Welcome. We have several bots for game efficiency as well as entertainment. Contact Dark Rolyzzz #9997 on Discord or DarkRolyzzz on Forums for questions or more info. United we can dominate this galactic revolution!!!!! TheRevanites are looking for new followers! TheRevanites is an active guild with 47 members looking for new players with at least 1.5 million power to become a follower of our master Revan. Currently farming tier 6 Sith raid working towards heroic. Heroic Pit and Tank raids on farm, launch at 8pm and 9 pm eastern US, 24 hour sign up period. Relaxed and friendly group. Guild rules require daily activity, communication in game chat and Discord, minimum 300 raid tickets daily, sign up for all raids, and participation in TWs/TBs. Contact Tortugas#3828 on discord for more information or if you are interested in joining. 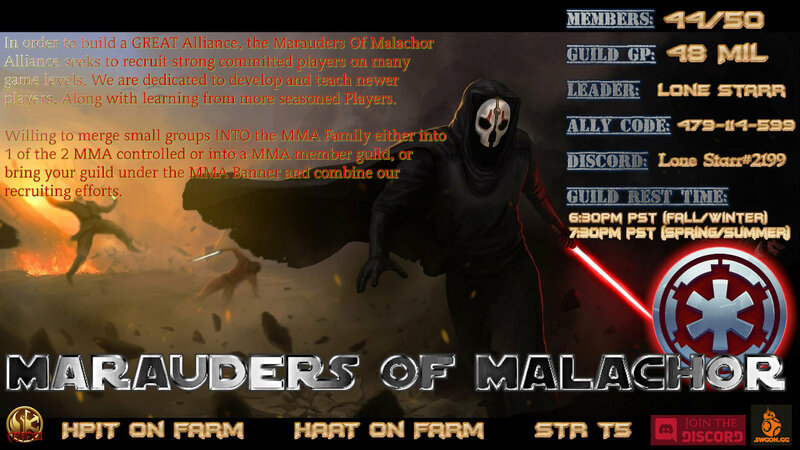 We are looking for both experienced and new players, a few of us have second accounts at lower levels so we are happy to help low level players as long as they are active. Are main accounts are 2.6m GP - 3.1m GP. So higher level players are welcome as well. We can do Hpit and HAAT. 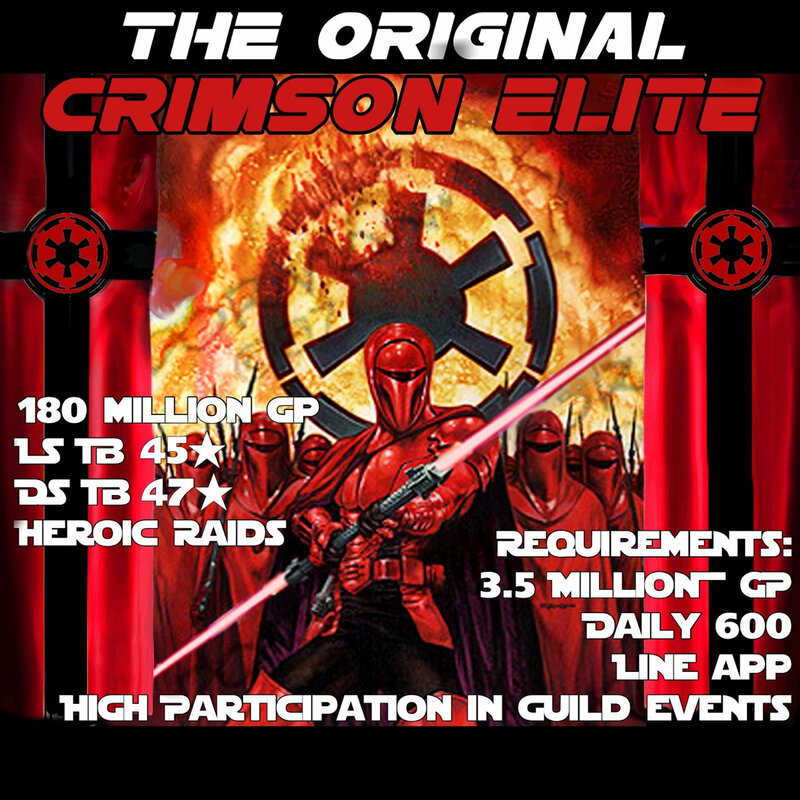 Sith raid we are doing tier 4/5. We need more players for Territory War and Territory battle but myself and the officers have are experienced in both and once we have the numbers we will be able to achieve high star in TB and battle competitively in TW. We have no requirements for new players other than they participate daily and try to max their ticket contributions. Looking to fill our ranks. Began just a few weeks ago and only 5 spots open. We want you! This Guild will take all. A newbie with no clue what to farm, who to get, or what path to follow, a seasoned player wanting to contribute, a heavy hitter wanting to make a difference, a merc looking to retire and find a home. BRG Wayward Knights is a 130m gp guild looking for a few HSTR ready members. We are a group of active players that play because we enjoy the game, and don't feel the need to institute hard activity requirements. We understand life comes first, and as long as you're communicating on discord and respectful of others, you won't get kicked for a missed day or a vacation/ holiday. We have HSTR on farm and are now looking to bolster our numbers. We are a global guild, so HPit and HAAT raid times rotate 6 hours each time. We are members of the BRG alliance which is unlike most alliances in that it is a group of independently managed guilds that help each other out when needed. No structure or regulations in place to make this game feel like work.